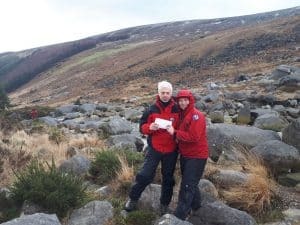 The Glen of Imaal Red Cross Mountain Rescue Team and Dublin Wicklow Mountain Rescue Team have, once again, joined forces to advance mountain rescue services in the east of the country. 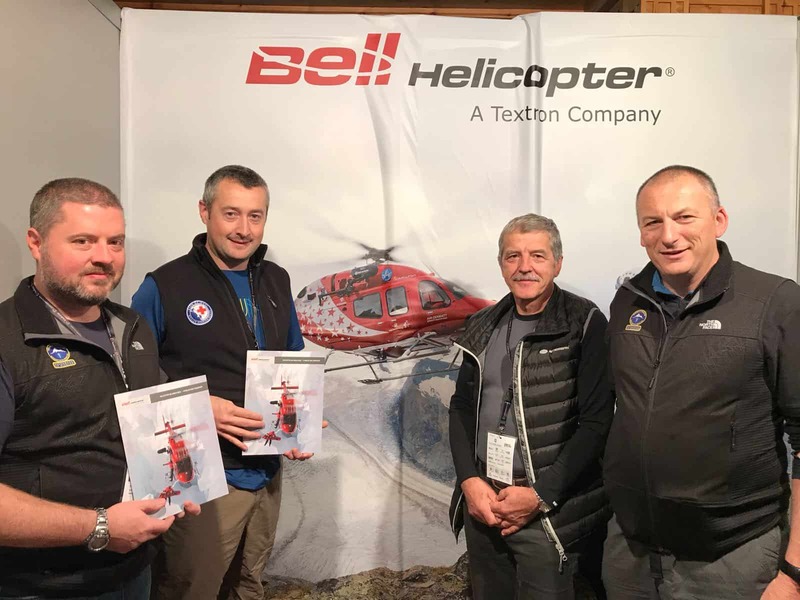 Representatives from both teams met with Bell Helicopters last October at the International Commission for Alpine Rescue (IKAR) congress, in Soldeu, Andorra. After some negotiations and a long wait, terms have finally been agreed and the teams will accept delivery of a BELL 1LIRPA next week. Although Mountain Rescue (MR) Helicopters are commonplace in other countries in Europe and New Zealand for example, this will be Ireland’s first dedicated MR Helicopter. This solar powered helicopter is ideal for use in mountainous areas and has a versatile and spacious interior allowing for team deployment of up to 14 personnel or it can be configured to carry up to 4 patients or 2 critical patients. The new Bell 1LIRPA will be based out of Newcastle Aerodrome, an ideal location for fast access to the Wicklow Mountains. 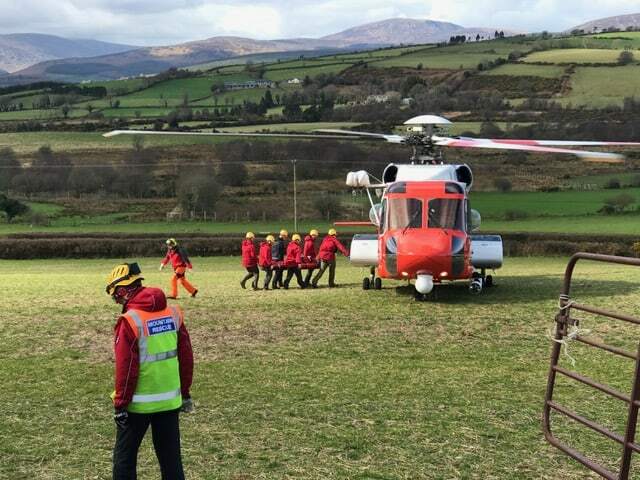 A site close to the round tower in Glendalough has been identified as a possible helipad for evacuations and talks with the relevant authorities are ongoing. The purchase of this helicopter has been made possible by the receipt of a substantial legacy, the benefactor of which, wished to remain anonymous. Glen Team member Sheelagh O’Malley receives a cheque for the generous donation of €850 from Alun Saunders of the Bray Strollers. 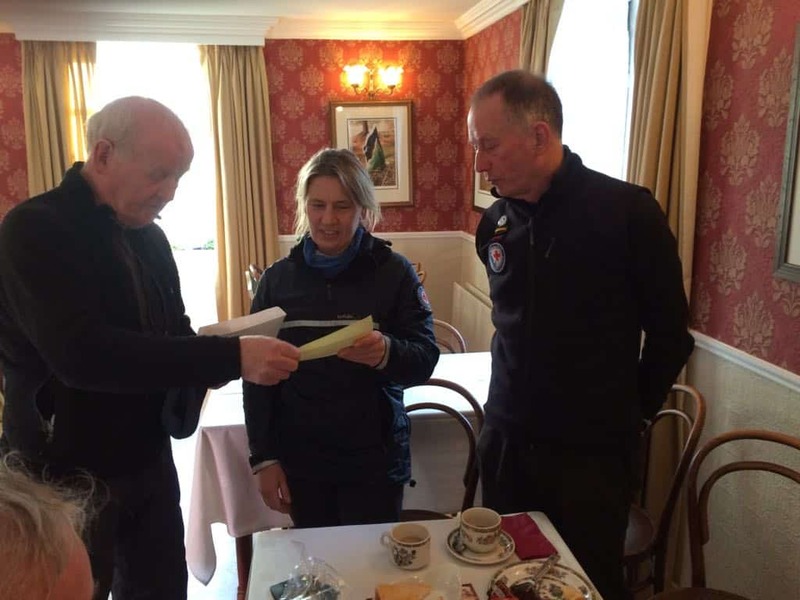 On Monday Jan 15th Noel Dowling of the SIPTU Hillwalkers presented a cheque to Ann Fitzpatrick and Robert Power of the Glen Team for €2050, as an acknowledgment of the work that we do and the service we provide to members of the public who find themselves in difficult situations every year. The SIPTU hillwalkers have been long time supporters of the Glen Team and today remembered their member Kevin McMahon who tragically lost his life in the Wicklow Mountains in 2016. The Glen Team wish to thank the SIPTU Hillwalkers for this generous donation, which we truly appreciate and which will go toward helping to maintain a dedicated voluntary Mountain Rescue service in Wicklow and surrounding counties. PHOTOS and TIMINGS for Moonlight Challenge 2017. Some more photos to come soon. A big thank you to all participants and of course volunteers who made the Moonlight Challenge 2017 such a huge success yesterday. We appreciate your ongoing support more than you know and hope to see you all again next year. Timings and photos will be up on the Moonlight Challenge website in the next few days, but for now pencil Saturday 24th November 2018 in your diaries. Angela Sweeney Award winning team Umbles! We are shocked and saddened by the loss of Rescue 116 and its crew. On a day that celebrates what it is to be Irish, our thoughts are with the families, friends, and colleagues of Captain Dara Fitzpatrick, Captain Mark Duffy, winchman Ciarán Smith, and winch operator Paul Ormsby. We should take a moment to think of the countless lives that these four remarkable people have touched. Our rescue work regularly brings us into contact with Irish Coast Guard search and rescue (SAR) helicopters, and in particular Rescue 116. The dedication, skill, and bravery shown by the crews of our SAR helicopters is evident every time we work or train with them. As we remember the crew aboard Rescue 116 last Tuesday morning, we also thank all those who fly, sometimes into the unknown, to help those in need. The Glen Team visited Coolmooney Camp recently, on a training exercise. While there we attended a talk on the impact zone in the Glen of Imaal, which was given by Army personnel. After the talk the team practiced with flares, which are be used in certain rescue situations. Many thanks to the Irish Defence Force’s for welcoming us to Coolmooney Camp for one of our training night’s.